The BBC with much fanfare has been leading its news bulletins all day with the apparent good news that the UK CPI Inflation rate had fallen in mAY to 2.8%, its lowest level for 2.5 years, with it's economics experts and members of the general public presented as painting the news as a highly positive development. The BBC's reporting illustrates the inherent flaw in the mainstream press that it is populated by Journalists who primarily regurgitate the views of vested interests including ivory tower academic economists. The facts are that the UK inflation rate that the BBC and the mainstream press and academics wholly focus on, is in actual fact just a measure of 12 month momentum, what it does not do is give the real picture of the ever present consequences of the Inflation trend. Inflation coming down and is providing much needed relief. Lower fuel prices are good news for motorists. On the subject of family and households, it is clearly good news, they have had to put up with very high inflation. much lower pay rises, now that inflation has fallen the squeeze on their budgets will be easing a little bit, and the wider measure of inflation RPI also fell pretty sharply. Know this there is NO good news in today's inflation rate for it has taken the UK to go back into recession for the UK inflation rate to just dip below 3% it's maximum upper limit as evidence of Britain and much of the rest of the western world being in an Inflationary Depression. In fact the inflation fraud is such that in our modern world of continuously improving worker productivity should constantly result in FALLING Prices ! The reason why prices as a whole rarely fall is because of continuous ever persistent government money printing no matter what form it takes, be it printing of debt (government bonds which are NEVER repaid, i.e. total debt level is never cut), or the recent buzz word Quantitative easing, which in reality is Electronic Money Printing in its purest form for unlike debt money it has no economic activity to back its creation and is highly inflationary, highly toxic to the purchasing power of a fiat currency which is why no matter how hard the Bank of England, the government and its BBC propaganda mouth piece tries to fool the general public there is very vicious all consuming in terms of loss of purchasing power of wealth and earnings, EXPONENTIAL Inflation trend in progress. The following graph illustrates the actual EXPOENTIAL INFLATION MEGA-TREND that the people of Britain are exposed to which Government propaganda tries it's hardest to mask from the public by constantly focusing on just momentum that is the annual change. The above graphs show that over the past 5 years your money on the official CPI measure has been eroded by Inflation to the tune of 17.2%!, This IS the reason why your real experience of day to day living expenses does not match government / BBC propaganda. However it is even worse because as I keep mentioning the rate of Inflation is EXPONENTIAL. What this means is that if you stuffed money under your mattress 20 years ago, today it would have been inflated away by 52.5% CPI and on the more recognised measure RPI of 74%, to be worth approaching half its original value. The inflation mega-trend is forcing you to either spend or put it money into a bankrupt bank for a pittance in interest that is TAXED, so that it is near impossible to consistently get a return that is greater than even the official rate of inflation let alone the real rate of inflation that is currently about 4%, as governments continuous tinkering with the methodology to reduce the official inflate rates as you experience when you go to do you weekly shops that usually stands about 1-2% above official CPI. I have seen many market / economic / academic, mainstream press, blogosfear commentators write that Inflation or Deflation does not matter, which is usually because they had bought into the academic deflation propaganda many years ago, so having discovered that they are wrong, but are unable to disinvest themselves from what does not work so instead spout nonsense that Deflation or Inflation does not matter, for instance one prominent deflationist - Mish, even goes so far as writing that falling prices are not necessary for Deflation. Which illustrates in one sentence the degree to which the deflation propaganda lunacy continues to persist everywhere, right from the BBC through to the whole media spectrum. 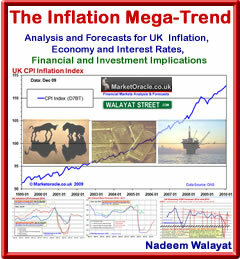 To see why it matters go take another look at the above Inflation graph's. Now as an investor what would you do ? Would you bet against these trends such as debt deleveraging deflation mantra fools continue to do, or would you seek out ways to monetize on this rather obvious Inflation Mega-trend ? Know this that the Inflation Mega-trend is not a 50/50 proposition, it is the over-riding trend that drowns out all other trends, which is why as I wrote over 2 years ago in the Inflation Mega-trend ebook (FREE DOWNLOAD) that Deflation can only ever exist as mere ripples on an ocean of Inflation. The only way to protect your wealth from the inflation stealth theft of wealth is to identify where the continuous flood of central bank money printing (Liquidity) will cycle through next, for the past 3 years I have identified this as the stocks stealth bull market (15 Mar 2009 - Stealth Bull Market Follows Stocks Bear Market Bottom at Dow 6,470), and more recently I am seeing preliminary signs (pending in depth analysis) of the exponential flood of fiat currency starting to wash over the UK housing market, first saturating and to eventually overwhelm the deflationary forces that the academics blindly solely focus on in perpetuity. The key point is this that asset prices fluctuate around the exponential inflation mega-trend, these price fluctuations are driven to extremes of market sentiment from manias to depressions. In which respects the UK housing market having experienced its Mania into August 2007 (22 Aug 2007 - UK Housing Market Crash of 2007 - 2008 and Steps to Protect Your Wealth ), has been more recently showing signs of emerging from its depression as the ultimate resolution is always towards a trend towards rising prices as a consequence of the clear and ever present Inflation Mega-trend. For in depth analysis on Inflation Mega-trend aspects and market consequences, ensure you are subscribed to my always free newsletter.